All over Tamil Nadu, tens of thousands of people, largely not under any political banner, have been protesting against the ban on jallikattu since Tuesday. The most widely broadcast protest was from the Marina beach in Chennai. But the Marina beach protest is actually very small compared to the ones taking place in other parts of Tamil Nadu including Madurai, Erode, Salem and Coimbatore. It's not only big cities but small towns and villages as well which have joined the protest against the ban, thus uniting the length and breadth of Tamil Nadu. 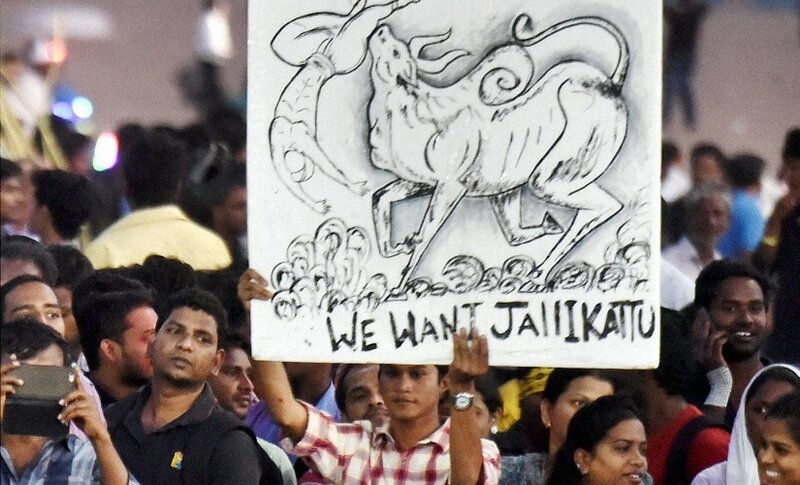 “We want Jallikattu” is a cultural as well as a political demand. People had assembled in protest from Tuesday night, but the “national media” didn’t live-broadcast it. Perhaps because this was not Delhi and hence didn’t matter to the “nation”. As the day progressed on 18 January, young people from all walks of life spilt onto the streets, from students to IT professionals to farmers, including many, many women. 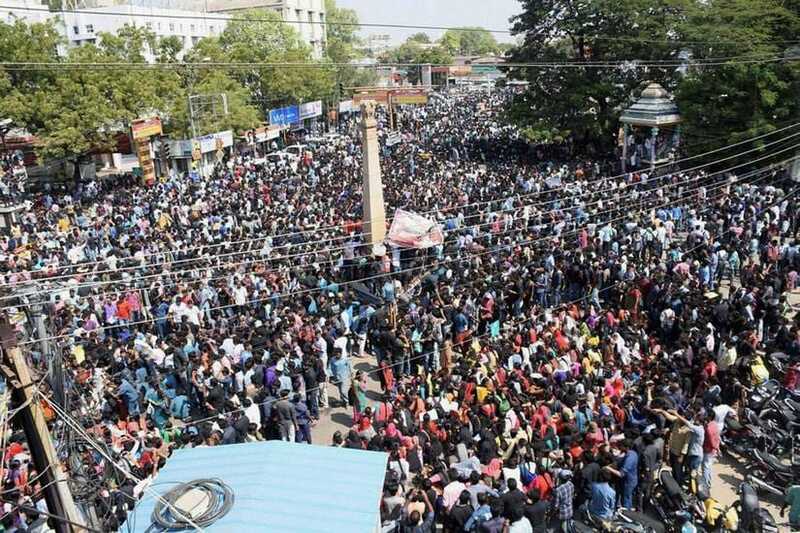 As we speak, this has become too big for the “national media” to ignore, and since this is not Kashmir from where independent media and telecom connectivity can be blacked out at will, “national media” wants to explain to the ‘rest of India’, why are Tamils angry and why are they protesting? While they ask that, they are quick to add that the protests are apolitical. Nothing could be farther from truth. The protests are not partisan but are intensely political — uniting the Tamil polity in a united voice. More things unite Kashmir and Kanyakumari than the Delhi establishment would like to admit. In its limited imagination, the non-Tamil media is likening this to Tahrir Square of Cairo. If they had more local grounding and less of an imaginary that is inspired by Anglo-American talking points, they would have reached back into the not so distant Tamil past. They could have looked closely at the site the protesters chose. The Marina beach is not an ordinary spot. It houses the memorial to CN Annadurai, the giant of Tamil politics, the biggest votary of Tamil pride, a staunch opposer of Hindi imposition and one of the fathers of federalism in the Indian Union. If they had tried to understand Tamil Nadu from the Tamil standpoint and not from the Delhi's, they would have found that the present protests, in their spontaneity, intensity and popularity come close to the anti-Hindi imposition protests of 1965 when the Union government tried to forcibly shove Hindi down the throats of non-Hindi citizens of the Indian Union. While protests against the Hindi imposition happened in various states, the Tamils took the lead. The response from New Delhi was swift and the central forces killed nearly 400 Tamil protesters that year. 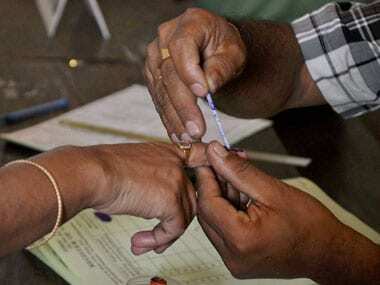 In 1967, the Congress was voted out and never again has any Delhi-headquartered party ever held power in Tamil Nadu. 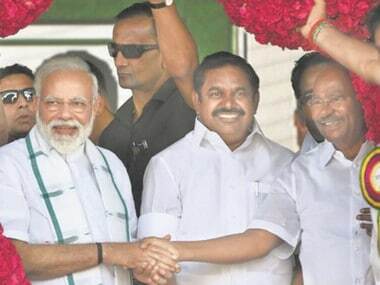 The Tamil Nadu branches of Delhi–headquartered parties failed miserably in 1965 and are failing miserably even now in representing the Tamil sentiment for their priorities and ideologies are decided elsewhere, without an eye to the Tamil interest. Since 1967, Tamils have politically opted for their own representatives and not Tamil agents of Delhi. It is because Tamil Nadu stood up against Hindi imposition that all non-Hindi states have been able to protect their cultural and linguistic turf against homogenisation ordered from Delhi, that is designed to benefit a certain ethnolinguistic group that holds huge sway on power in Delhi. Even today, with the jallikattu protests, the Tamils have opened the space for the rest of us to assert our cultural rights against the whims and fancies of the agencies of the Union government that imagine the Indian Union as a bloated form of the NCR. 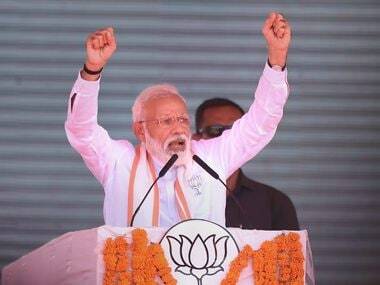 The way the Union government has been criticised by the Tamil protesters on the ground show that they understand this political dynamic very well. The huge presence of women for a “male sport” shows that this issue goes beyond the particulars of jallikattu and stems from something bigger and wider. Even non-resident Tamils from around the world (in USA, Ireland, Mexico, Thailand, South Korea, Ukraine, Russia, Malaysia and elsewhere) have joined in the protest on the Tamil social media space where unlike in Noida, Whatsapp messages about bovine animals are being used to unite people and not divide them. The Jallikattu protests show that against the cosmo-liberal stereotype of “Indian young people”, there are young people, millions of them, to whom roots, identity and culture matters and they do not aspire to lose their Tamil-ness to make the cut in the Delhi-Mumbai idea of Indianness. These are people who know English very well but have chosen to respond in Tamil to Delhi media's questions posed to them in English. If this appears odd, remember the number of times Delhi-based English media carries responses in Hindi without any translation. Try to think why that is not considered odd when a majority of the citizens of the Indian Union do not understand Hindi. In the protests, a recurring theme is that the Tamil interests have been marginalised in the Indian Union. The Tamil culture is older than the Indian Union, and its self-respect and institutions are very important parts of that culture. The fact that Tamil Nadu now doesn’t have control over its own maritime trade, foreign relations or for that matter most aspects of Tamil internal affairs, is hardly two centuries old. The Tamil political memory and historical consciousness goes far beyond that and is a living thing that influences politics of here and now. 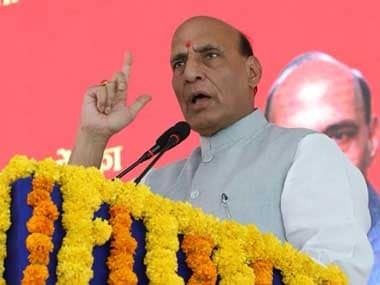 Thus, whenever the Union government has destroyed state rights, the Tamils have been at the forefront of protesting it, a strain of politics that has recently widened to include Mamata Banerjee in West Bengal, who has been regularly voicing concerns about the destruction of the federal structure. The Tamils gave up their autonomous rights over their land, resources and people when they signed up for the Indian Union. Any giving up of rights have to come with concomitant compensatory benefits. That has not happened. While Tamil Nadu produces a huge amount of revenue, much of that is siphoned off by the Union government through its constitutional powers and through the discriminatory schemes of Delhi, it gets much less money (the so-called “central funds” which originate from the resources based in the states) than the amount that Delhi makes from resources in Tamil Nadu. In short, Tamil Nadu’s resources are used to subsidise Union government schemes outside Tamil Nadu. During the Eelam Tamil genocide, the Union government explicitly sided with the Sri Lankan government, thus making clear that Tamil Nadu’s sentiments matter little to Delhi even when it comes to the genocide of Tamils elsewhere. Thus it is only natural to think that many Tamils feel that they are getting cheated in this deal called the Indian Union. At this juncture, it doesn’t help when the so-called “national opinion” brands make fun of Tamils as irrational or barbarous people who love to be cruel to their animals. If at all, it is quite duplicitous since Delhi doesn’t mind the revenue that is extracted from Tamil Nadu while using its institutions like the Animal Welfare Board of India to undercut Tamil cultural practices. That is the tragedy of a centralised administration where bureaucrats from high female foeticide states get to decide the women’s rights policies of socially progressive states like Tamil Nadu. Whether Jallikattu is right or wrong, should it be discontinued or not, or continued with modifications, is an out and out Tamil affair. That the Animal Welfare Board of India, which doesn’t exactly reflect Tamil opinion, gets to decide on this shows how Tamils are infantilised as being incapable of deciding their own affairs, including their own cultural practices, or for that matter, animal welfare issues. This stems from the two long lists called the Union and Concurrent lists of the Constitution of India that gives almost unfettered right to the agencies of the Union government over the lives and issues of people of various states. It is this false federalism, in which state rights have been completely disrespected, is the source of most of the problems, and the solutions to this are achievable within the ambit of the Constitution of Indian by large scale move of subjects from the Union and Concurrent lists to the State list in keeping with the federal democratic spirit of the Cabinet Mission plan of 1946, to which most elected lawmakers of the time agreed, only to turn their back on it after 1947. Yes, reforms are needed and they can take many shapes. The ambit of the Supreme Court can be limited to Union and concurrent list subjects with state-based apex courts becoming the highest authority on state subjects. This along with a move of most subjects to the State list can realise the full federal democratic potential of the Union of India. Otherwise, such deep-rooted political grievances promote alienation and make their presence felt in some way or the other, in not so palatable ways. While deciding to hang Afzal Guru, in spite of many grounds for reasonable doubt about the case, the Supreme Court of India said, “The collective conscience of the society will be satisfied only if the death penalty is awarded to Afzal Guru.” If the “collective conscience” of the society has already been admitted by the Supreme Court to be a decider in handing out judgements, what prevents it from listening to the “collective conscience” of Tamils regarding jallikattu that is on display in the protests all over their land today?